BACK IN FAVOR --- FINALLY! Luscious, healthy, aromatic, useful, organic coconuts! It is ABOUT time that the lowly coconut received the notice it so richly deserves! If you have avoided eating coconut or coconut oil, for fear of getting fat on it, or for fear of the fat IN IT, you are in for a most pleasant surprise! For healthy hair, and to help restore your hair to its natural color without the use of chemical dyes, try coconut and coconut oil! GOD'S NATURE RESOURCE FROM THE ISLANDS! For more years than I would like to remember, the "establishment" has touted polyunsaturated oils as the "be-all-to-end-all". I never could quite understand that, because, with the exception of olive oil, the oils available at the supermarket were all TASTELESS! Since I have been researching healthy ways to eat since 1972, I was already aware that the Crisco, spreads, margarine, safflower oil, corn oil, canola oil, sunflower oil, and vegetable oils decorating the stores' shelves were all heated, bleached, chemically processed, and devoid of life. An oil should have a robust bouquet, color, and FLAVOR. In order for an oil to have all of its nutrients preserved, it has to be TRULY cold-pressed. Even though the labels of a lot of oils say "cold-pressed", the truth is that most of them are not. So many of the oils on the market today have been heated, bleached, deodorized, and refined. Olive oil and coconut oil appear to be the least tainted, but I have purchased BOTH from many companies that have absolutely no hint of the oil's origins --- in appearance, or taste. At last, I have found a company that carries coconut oil that TASTES like coconut, smells like coconut, and is good enough to eat right out of the jar, with a spoon! Nutiva, and it is the only one we eat. * Some other brands utilize heat and fermentation, waiting more than 10 hours between chopping the coconut and pressing the oil, adversely affecting flavor. 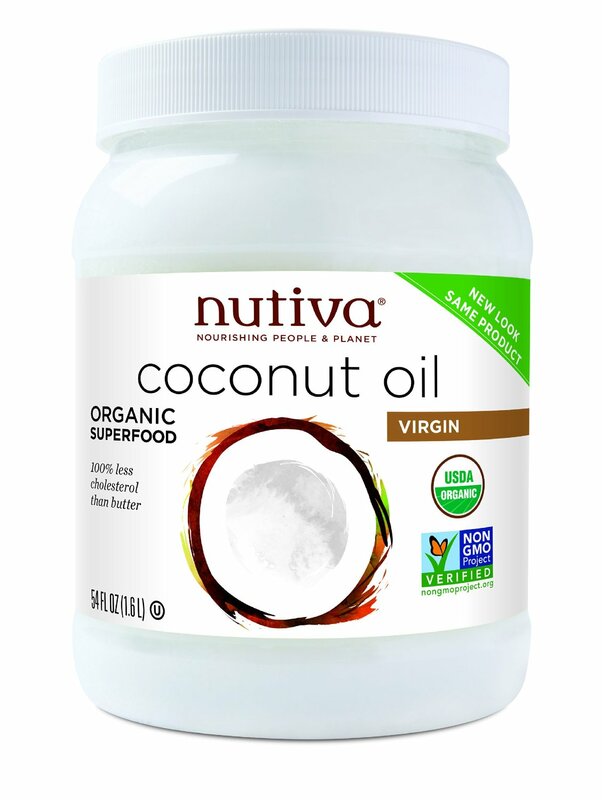 Please Note: Nutiva's Coconut oil - and most properly processed coconut oil - is solid at room temperature and melts at 76°F. No refrigeration required. In tests done on human hair using mineral oil, safflower oil, and coconut oil, only coconut oil actually was beneficial to the hair shaft itself. Coconut oil has a natural affinity for protein, and "binds" its nutrients to your hair. Use it as a pre-shampoo conditioner, or after shampooing, put a few drops in the palm of your hands, rub them together, and run through your hair, from the underneath up through the top - your hair will just shine and be soft and silky. I have had my hair totally change its texture, and a lot of its color, ever since I started consuming Nutiva coconut oil daily, and about 3 tablespoons of chia seeds. I just like to mix the chia into whatever I am eating. Sometimes I run it through my little nut grinder first. Often, I add some raw, sulfite-free shredded coconut, as the coconut meat has additional nutrients that are not present in the oil. My hair is starting to look like it is healthy hair again, and at 62 (in 2014), I am ecstatic! P.S. I also stopped shampooing my hair with regular shampoo, and started using RenPure Cleansing Conditioner. At first, it felt "odd", as I missed the lather of shampoo, but after viewing the results - my hair looks and feels terrific!